One can feel the immense tropical mood once stepped into the interior. The natural texture, earthy scents and richness of wood have ensured design possibilities that seem virtually endless. The timeless appeal of a modern tropical design livens up this interior space. Earth tone colours like cream and warm grey were used to bring out the nature of the space and also to match the wood texture that was incorporated. The choice of this scheme was used to create a sense of warmth and tropicality in its interior. 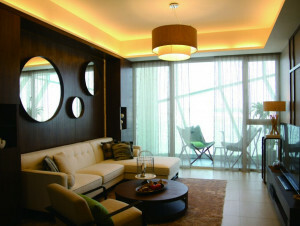 Furniture fittings, lights and accessories were picked out by hand to harmonize with the character of the interior. Mural wall painting are placed to beautify the children’ room and to bring out the characters of the children. The delicate choice of cartoon character with an Asian touch, Totoro, was introduce as a significant icon to the tropical theme, bringing back the sentimental element of nature which is then carefully blended into the space. A symphony of raw materials that sync together with the neutral palette colour heighten the coziness of the space and gives off a back-to-nature theme. The design ideal was to respect the nature and bringing it into the space. Circular mirrors are design in the living room to set as an iconic element representing the topography of trees. The clever manipulation of a symbol is translated into a tropical theme design.